Baird's beaked whale (Berardius bairdii) is a member of family Ziphiidae (beaked whales). They can grow up to 12 m, females are larger than males. Baird's beaked whales are found in the North Pacific Ocean, the Sea of Japan and the southern part of the Sea of Okhotsk. They prefer seas over steep cliffs at the edge of the continental shelf and feed on deep-water fish and squid. Photoidentification of individual Baird's beaked whales showed that there is a small local stock of this species in the waters of the Commander Islands, numbering about 230-270 animals. 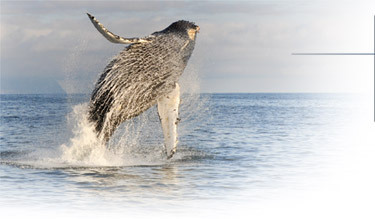 We found no matches between the whales identified in the Commander Islands and mainland Kamchatka. Genetic analysis revealed differences in haplotype frequencies between these areas, suggesting at least partial separation. We found that Baird’s beaked whales seriously suffer from entanglements in fishing gear: 80% of whales off Kamchatka and 94% of whales in the Commnader Islands had scars from entanglement.